may, none the less, be suffering substantial harm during the many years in which the metabolic state that leads to type 2 diabetes is present and slowly becomes worse and worse. if pre-diabetes is a state that causes harm in itself, beyond being associated with or promoting the development of T2 diabetes, then at what point in the change from normal metabolism to T2 diabetes does the harm start? in people who do not meet the criteria for diabetes as used by the researchers. Related to this is a video posted below, which goes into this in more detail. With prevalence reaching alarming proportions worldwide, MetS is now considered to be the driving force for a cardiovascular disease epidemic. In this context, the present study underlines the necessity for a close clinical RV monitoring in MetS patients even when type 2 diabetes is not associated. highlighting the need for treatment of central fat and inflammation to decrease or prevent the deleterious impact of MetS on RV function. Finally, the present work emphasizes the importance of lifestyle changes since the RV dysfunction can be corrected even only three months after an exercise and nutrition intervention. Ricardo Fontes-Carvalho, Ricardo Ladeiras-Lopes, et. al. Diabetes increases the risk of heart failure but the underlying mechanisms leading to diabetic cardiomyopathy are poorly understood. Left ventricle diastolic dysfunction (LVDD) is one of the earliest cardiac changes in these patients. is recognized as an important predictor of heart failure  and long-term mortality . Several studies have suggested that LVDD is one of the earliest signs of myocardial involvement in type 2 diabetes mellitus (T2DM) , being a key component of diabetic cardiomyopathy . More recently, it was suggested that changes in diastolic function precede the onset of diabetes, being already present in pre-diabetic patients [12,13], which could be associated with the state of insulin resistance. Indeed, patients with metabolic syndrome also have an increased prevalence of LVDD [15,16], frequently with a subclinical course . 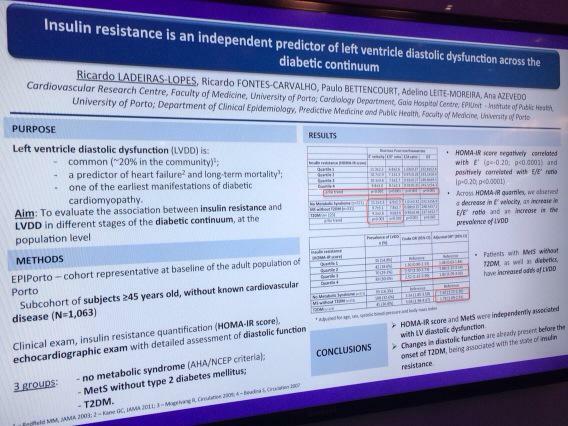 Insulin resistance and metabolic syndrome are associated with diastolic dysfunction independently of age, blood pressure and body mass index. These data suggest that subclinical changes in myocardial diastolic function are already present before the onset of diabetes, being associated mainly with the state of insulin resistance and not only to sustained hyperglycemia. Future research will determine if improving insulin resistance using insulin-sensitizers or lifestyle changes can improve diastolic function. Dr. Richard K. Kraft, now age 95, became interested in the topic of diabetes many decades ago. Being a pathologist, he was most concerned with studying the damage caused to body tissues by diabetes. He did a great many autopsies and thousands of 5-hour glucose tolerance tests where both blood glucose and blood insulin levels were measured. Over time, he has become convinced that the damage to the body starts in the stages before the blood glucose levels show as elevated in the standard tests. This is well-explained in his book and in this interview conducted July 31, 2015. Dr. Kraft’s work has been under-recognized but fortunately recently came to the attention of Professor Grant Schofield, of New Zealand. LINK Prof. Schofield and Catherine Croft, one of his research team, are currently looking into Dr. Kraft’s data and concepts and seeing how this translates to clinical and research implications today. Others have taken up the task of bringing Dr. Kraft’s body of work and concepts to greater awareness – so the ideas can be considered, discussed and explored in research as warranted. Ivor Cummins, an engineer who has over some years developed a keen interest in metabolism and nutrition, has played a prominent role in getting out the word that Dr. Kraft has some very interesting ideas that warrant attention and discussion, and that Dr. Kraft’s ideas were built on a truly remarkable body of work and data.